Last summer most of my Air National Guard C-130 squadron was activated and deployed to Qatar for a month in support of the War on Terrorism. 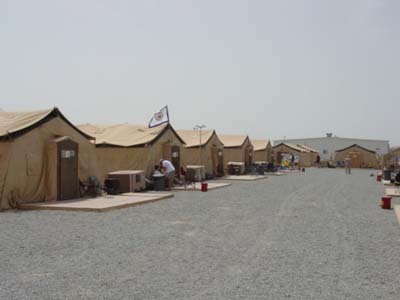 While we were there we lived in tents and airlifted many tons of cargo into Afghanistan in support of US Special Forces and others operating there. Others may disagree, but we returned feeling that we had done our part to make the world a slightly safer, saner place. At the beginning of this year many of us watched with great interest as our new president began to give Iraq deadlines and began to activate reserve units to back up his ultimatums. 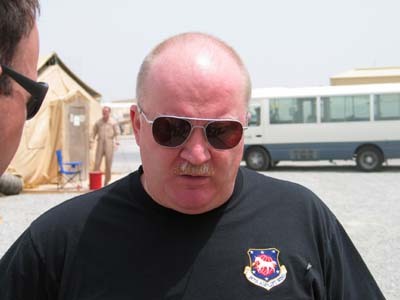 Our commanders told us that they had been to high-level briefings and had been assured that we had already done our tour of the desert and would be kept home this time while other squadrons deployed. Some of us, however, had been around long enough to see this movie before, and we began to prepare for another deployment. I had recently visited the wonderful Apple store in Towson, MD, and after looking at all the products there, had decided to buy a new iMac. I realized that if I were to deploy again, though, that I should buy a laptop I could take with me and use to listen to music and watch movies in my tent. I looked through the various Mac catalogs I had at home and after much deliberation ordered an iBook from MacMall. I was soon very glad I had done this, as we were activated before my new laptop even arrived, and the day after it arrived I received a phone call telling me that I would be heading out to a remote desert location the next morning. This tight timetable didn’t leave much time to prepare. After packing the rest of my things I took the iBook out of its box and was immediately impressed with its appearance. The glossy white case was said to be made out of polycarbonate or adamantium or some other mysterious substance, and it was much more stylish than the cases of the black Windows slabs I used at work. I liked the way that the Apple logo on the back cover illuminated when the iBook was turned on and appreciated how quiet the computer was when it was running. It had no handle but had a very sturdy hinge, continuing a tradition that goes all the way back to the first tangerine iBooks. Booting the iBook for the first time was a pleasant surprise. I had seen LCD monitors in the past that did not have sharp text and graphics displays, but both of these were very sharp on the iBook’s screen. The keyboard did not feel as solid as some of the other laptop keyboards that I had used but was entirely acceptable. As I began to type I noticed that the keyboard had a delete key but did not have a backspace key. I am such a poor typist that I spend a lot of time correcting my typing errors and am in the habit of making extensive use of both the backspace and delete key. As soon as I began to use the iBook keyboard I found myself missing not having both a backspace and delete key to use to clean up my mistakes. Better typists than me, however (in other words, everyone else in the world), will probably not even notice. The iBook runs through a set-up and online registration process the first time you log on. Parts of this were confusing to me, possibly because I was in such a hurry, and when it tried to do the online registration at the end I got a message telling me that it had not worked. I quickly tried to check my modem setup and connections, and when I couldn’t find the problem I decided to troubleshoot it later. I then loaded several Zip disks with MP3 music files from my old iMac, plugged the USB Zip drive into the iBook, and loaded some of my favorite music into my new iBook. The USB’s “plug and play” capability made this very easy, and iTunes recognized all the music files. iTunes also made it very easy to begin building a music library. I use Quicken 2000 on my old iMac and my new iBook came with Quicken 2003, but when I tried to move my old OS 9 Quicken files to my new OS X Quicken it did not seem to recognize them. I eventually realized that it had recognized something, because Quicken 2003 now had my defaults, saved transactions, and balances, even thought it said that it had not recognized my old backup files. I was completely puzzled at this, but decided that I had transferred enough information to be able to keep track of my finances while I was deployed. I then tried to transfer my OS 9 America Online 5 to the iBook, planning to use that to log in and upgrade to AOL OS X, but that didn’t work at all. After a few attempts I gave up, realizing that I would not have access to AOL e-mail for the next few months anyway. In spite of what I had heard and read from a variety of sources, I found navigating Mac OS X to be very straightforward. This may have been due to my having used a variety of operating systems and interfaces in the past, but for whatever reason transitioning to Mac OS X was completely painless for me. As I used it I could not help but smile at the fact that I had, on my lap, a machine with roughly the same operating system and roughly the same computer horsepower as the huge Unix computer I had used in college many years before. By fate or coincidence, three of the first people that I met there also turned out to have iBooks, and two had brought their iBooks with them. One of them spent an evening helping me set up my Preferences and organize my music library. I liked the features of iTunes, especially the ability to build, sort, and search a large music library, and the feature that tries to complete the album, group, or song title as you start to type it in (a friend tells me that this is called “autocomplete”). I found myself wishing that, like one of my other MP3 players, there was a better place in the song information file for me to type my favorite lyrics, but wanting to type the lyrics to songs and keep them in the song’s file is probably a quirk that few people share with me. I hadn’t had time to load Microsoft Office on my iBook before I left, so when I began to write things, including this article, I began to use AppleWorks. I had tried to use the version of AppleWorks that came with my previous iMac years before but had not liked it. I am not even sure what the differences are but the Mac OS X version on my new iBook seemed to be easier to use than the one I had given up on years before. I especially appreciated the fact that AppleWorks didn’t have the automatic formatting features that the computers at work had, running the Windows version of Microsoft Word. AppleWorks did not constantly make uncommanded and unwanted formatting changes to the simple reports that I was trying to write. When I transferred from a desk job to a flying job and needed to begin keeping track of my flights I found it easy to build an AppleWorks database and keep track of my flying information on that. I continued to customize my iBook desktop by moving the dock to the left, the AppleWorks button bar to the top of the page immediately to its right, and placing my AppleWorks documents immediately under the button bar and to the right of the dock. I left my aliases along the right side of the desktop. I now had what I considered to be a functional, aesthetic, and distinctly Mac-like desktop. Unlike my computers at work it did not have the annoying Windows Office toolbar that I never used and couldn’t get rid of or the Windows task bar at the bottom of the page with all those mysterious, irritating icons that I didn’t put there and didn’t want. Mac OS X, in contrast to Windows, seemed to do what I wanted it to do and nothing more, and that made it much more pleasant to use. The base did not have too many diversions but it did have lots of DVD movies that could be borrowed. The iBook’s DVD player worked well, although I did not always find the controls to be intuitive (I sometimes got all wrapped around the axles when I wanted to stop and restart a movie, for example). The iBook’s built-in Help function was quite helpful here and other places as well, although it often tried to dial up the Internet inappropriately. Another small glitch was the fact the external power plug is also very close to DVD drive, and the drive tray kept catching the cord when I opened or closed it unless I made an effort to loop the cord away from it. Having the jacks on the side rather than back is nice, but I wish the cord had an elbow at its base that would allow you to route it away from the DVD drive. This was a minor inconvenience, though, and I spent many relaxing hours watching movies in my tent. I had previously learned that one thing worse than living in a tent is living in a tent and worrying about my checking account back home. Since I had been able to transfer part of my Quicken, I was able to use Quicken 2003 to keep track of my finances while I was deployed, and this made life much less stressful. When we were given a complex schedule of vaccinations, boosters, and follow-up visits to the doctor I used iCal to track them, and when they rationed our phone calls home I recorded them in iCal as well to make sure that I did not exceed my quota. As my friends began to accumulate digital photos of our adventures I also found that iPhoto was a great way to store, view and sort digital photographs, and in a short time I had over 1,000 photos in my photo library. After I had been here several weeks and had learned how to encode music, watch movies, sort photos, and balance my checkbook I decided to look and see if I had missed any other programs that had come bundled with this machine. When I did I found a wonderful chess game with a three-dimensional view of the board. I have an interest in chess but am not a good player and hate being beaten over and over by the local chess enthusiasts. I didn’t mind being beaten by my laptop at all, though, and liked taking moves back to experiment with the various tactical possibilities. The iBook’s chess game just beat the hell out of the Solitaire and Minesweeper games on the Windows machines at work. I did not find much use for the Address Book. I had an AppleWorks address book database with about 300 addresses already and could not find a simple way to port it into the new Address Book program. Apart from the nicer presentation I could not find a reason to switch to Address Book either, so I have not found a use for that program so far. I do not much care for track pads, and the iBook, which did not come with a mouse, was no exception. The computers at work all had touch-screen type track pads, though, and I continually bump the surface of them and highlight or execute things when I did not want to. The Apple track pad kept me from doing that. I often used the arrow keys to move the cursor rather than the track pad but they did not always move the cursor do the way I expected it to. My issues with the track pad and directional keys, however, were small, and since I usually typed with the iBook on my lap in my tent the track pad was much more practical than a mouse would have been anyway. I resolved to get a mouse and good speakers when I got home and left it at that. 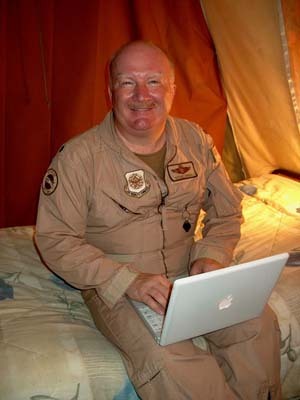 The iBook makes no claims to being ruggedized, as some of our military laptops are, but I found that it withstood the dust, extremes of temperature, extremes of humidity, and other stresses of desert life it was exposed to very well. So far I have bumped it, dropped it, set things on it, and taken it out briefly into the desert heat, and the only sign of wear or tear is that the paint starting to come off the button below the trackpad due to it being used so much. After four months of almost daily use in this very demanding environment, I am completely happy with my iBook, am very glad that I brought it to the desert, and am a very satisfied Apple customer. So there you have it, perhaps the most illiterate computer product review ever, one written in a tent in the desert and one that doesn’t use a single technical term and doesn’t even use any numbers. My hope was to write a review for The Rest of Us: those Apple users, like me, who have been considering making the move to a laptop and/or Mac OS X but who are unable to make much sense of the more technical reviews we read. This was my experience making that change, and I hope that this article can provide some insight into the utility and potential uses of a Mac OS X laptop, coming straight out of the box, for others like me. I had planned to end this article discussing the things I did with my iBook after I returned. After four months in the desert, however, the end of this mission is nowhere in sight, and it will probably be at least another month before I am allowed to rotate home. If I could end this article with a request instead, it would be to remember the Americans in uniform who are deployed. As you read this there will almost certainly be many young Americans far from their homes, missing their families but are doing their duty as they have been given light to see it. Let’s hope that their efforts do help make this dangerous world a safer place, and let’s hope that they are all able to come home soon.